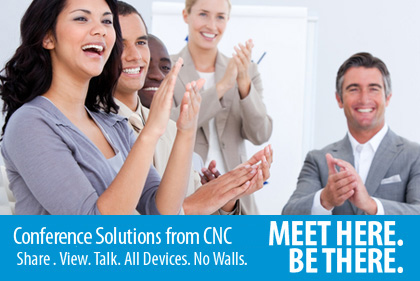 CNC Conferencing solutions help you build more effective teams across internal or remote barriers. Secure Web & Audio Conferencing is an IP-based, feature-rich and affordable collaboration solution. Users can easily schedule or instantly conduct brain storming sessions, training, and demo presentations. Invites, recordings and a host of other integrated tools are available. Give your customers instant access to experts. Assemble teams quickly, sharing the most relevant business information. Meet multiple customers, partners and colleagues from multiple countries on the same day -- in an experience that feels like everyone is in the same room. Multipoint video conferencing let’s you see your colleagues as if you were sitting across the table, no matter where they may be. Webcam participants are able to engage at a higher level. CNC offers dedicated and desktop systems with controllers ensuring digital compression and appropriate bandwidth solutions free of latency delays and featuring echo cancellation. CNC conferencing technology is further enhanced with tools such as desktop, application and file sharing, whiteboarding, text chat, polling, and more. Transform your conference room. Knock down the walls. Replace soundstation and one-to-many presentation equipment with our cloud-based many-to-many all-access conference bridge console. Mitel Collaboration Point™ delivers multimedia collaboration capabilities right to the personal office meeting space. Collaboration is no longer a special event, but now becomes a natural part of a productive work day. At a fraction of the cost of traditional multimedia systems, your team will have the ability to collaborate using rich multimedia as simply and spontaneously as making a phone call.